Engage with the fastest growing workforce community and find your future talent. Seamlessly add your job openings with easy-to-use tools at the click of a button. No more boring. Expose your brand, your culture, and your values with rich media and interactivity. Employer yourself with AI-Driven hiring that takes your hiring to a new heights at little to no cost to your business. Make a great impression on each and every visitor. You are more than just a job post. You are a brand. A culture. Impress your visitors with videos and announcements. Soft Skills analysis, Video Applications, and AI-Driven Hiring provide superior understanding of who the right is for you. Simple, yet powerful tools at your service. 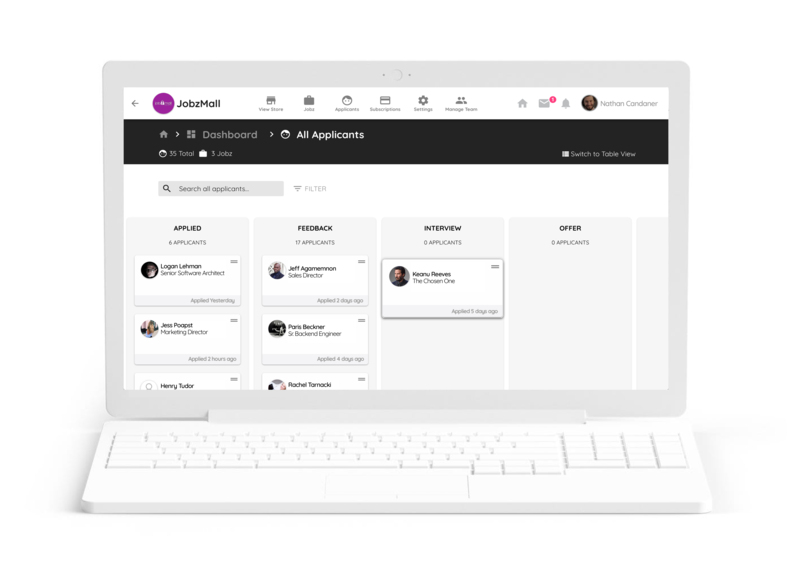 Custom hiring pipelines, internal messaging, and candidate automation all in one destination. With the average cost-per-hire looming at $4300, you need to spend $0 to start using JobzMall. Intrigued? Post your first job now in two minutes and join the new workforce revolution!